A very pressing and very legitimate concern when someone gets divorced is how much the divorce will cost them. Studies have been done comparing the costs of divorce state by state, and there are things that you can do to try to minimize the financial burden of your divorce. Studies that discuss the cost of a divorce usually compare the cost of getting the divorce itself. Filing fees, experts, and attorney’s fees are usually what are considered. The costs involved in the division (or complete loss of) of marital assets, or loss of income from a spouse, is not considered. One recent study found that the cheapest state to get a divorce is Montana, with an average cost of $8,400. The first and second most expensive states to get divorced were New York and California, both with average divorce costs exceeding $17,000. Florida ranked 15th nationally, with an average cost of $13,500. Florida also has the 8th highest divorce rate, and the 15th highest average attorney’s fee. It is important to remember that every divorce is different. A case where the parties have few assets may be quicker, and thus cheaper, than couples with millions of dollars in properties, businesses and investments to divide. The relationship of the parties matters as well. Even a divorce with a lot of property and assets can be inexpensive if the parties agree and can get along to work out a settlement. 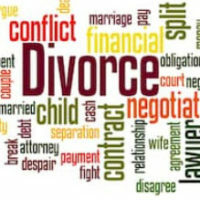 Conversely, a divorce with only 1 or 2 issues in dispute can be very expensive, if there is strong disagreement between the parties and an unwillingness to compromise. Spouses can minimize their expenses by trying to be reasonable in negotiations. Try to agree to anything that you can agree to, as early in the process as possible (without giving up any of your rights or “caving in” to the other side, of course). Money paid to a family law attorney for consultation about whether what your spouse is proposing is fair can save money down the line. Providing information and documentation when your attorney requests them can also help minimize costs. If your attorney needs information that you can obtain, such as school or employment records, it can help if you get those records and provide them. Agreeing to mediation early in the process can be helpful as well. Although the mediation itself may cost money, if a settlement is reached at mediation, you may be able to settle all pending issues saving time and money. Remember that if cost is a serious consideration, and you can’t find a way to minimize expenses, Florida law does allow a party to get temporary alimony or attorneys fees from the other side. Our Tampa divorce attorneys at the Pawlowski//Mastrilli Law Group can help you with any child support payment, collection matters, or defenses that you may need to assert in court. Contact us today for more information.